A few summers ago, the mom of the girls I was tutoring asked if I would make summer homework for the girls and their little brother. She just wanted something short and sweet that would keep them thinking and help prevent the summer slide. I came up with summer reviews for them. Then the following year, I made the next grade level up and now have prek-4th grade. Each week, I would give them a mini packet that included a math and a literacy page to work on each day. They would bring the packet bag for me to check and review with them and then I would give them the packet for the following week. Not only did it give them the homework that their mom wanted, but it also gave me a focus during tutoring time if I found skills that they were struggling with still. 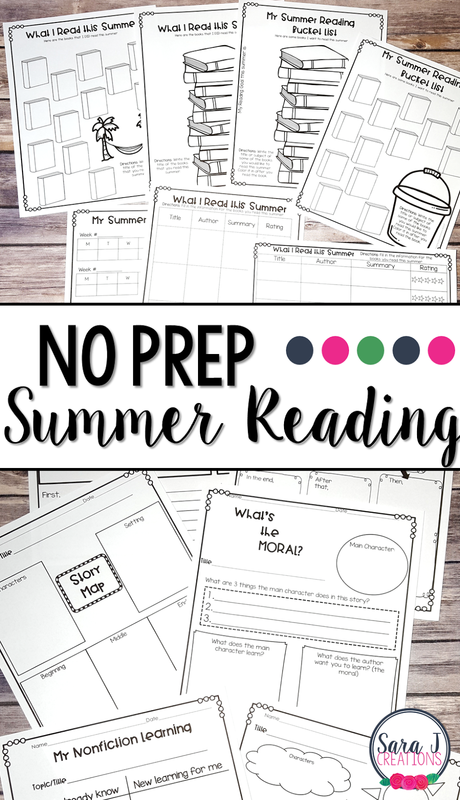 These summer reviews are designed to be a copy and print activity. There is no prep involved and minimal supplies needed. A few pages need scissors and glue/tape. There are a few spinner pages that need a pencil and paperclip to use as the spinner. You can print these as a packet or pick and choose what you want your students to work on. UPDATE: All Packets now include answer keys, cover sheets and a summer reading section. The grade level listed on these would be the grade level the student just completed. However, there is no cover page or label on each page to indicate what grade level it is, so you can use these with students in any grade level if it is a skill they need to work on. PreK and Kindergarten have 100 pages (50 math and 50 literacy) and the 1st-4th grade versions have 80 pages (50 math and 30 literacy) because I assumed older students will also have summer reading or spelling practice to do as homework. Click any of the pictures below to head to my TpT store and see what is included in each packet in more detail. Also, check out the preview of each item to see more of the pages that are included. As of June 2017, all summer reviews have been updated to include answer keys. I've also added 10 different cover options. I also added a reading component that includes reading logs, reading goals, and comprehension activities that could work with any book. Check out this video to see all the new additions and see more of what is included for each grade level. How could you use these summer reviews? Would you use it in class to review concepts covered? Or send it home as review/homework over the summer? Could it help the students you are tutoring this summer? Could your own children benefit from it? Oh man! Oh man! Someone is going to be one lucky duck. It is obvious you put SO much hard work into getting these created. They look great!